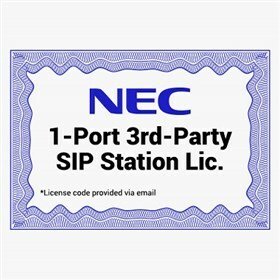 The NEC 1100089 is a 3rd Party SIP Station License, which required for each 3rd party telephone. Maximum 64 ports are allowed per system. It requires VOIP daughter board and appropriate quantity of VoIP channels. The NEC 1100089 has many exciting features for users of all types. The NEC 1100089 is sold as a Brand New Unopened Item.